Beautiful Horsehead ring perfect those who enjoy large rings or cigar bands. Enjoy many designs to choose from our extensive collection. The Gorgeous Horse is your source for quality equestrian jewelry. 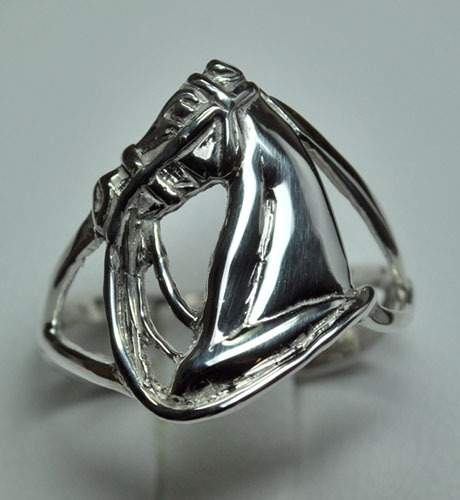 Wonderful Horsehead ring complete with the head gear and bold in design. If you enjoy large rings this might be the perfect fit for you. The head offers great features and brings this ring to life, ring is finished with two bands that look like leather straps and have buckles on them. The perfect gift for the horse admirer. Dimensions: 22mm wide at the top of the ring tapering down to two 2mm straps at the bottom. Please don't forget to use our request box below for sizing. Extra charges may apply.